This little introduction gives a good idea of the extraterrestrial and futuristic music one can expect to hear before listening to the debut album by this Californian quintet. Lumerians are alien species appearing in Star Trek : The Next Generation, and Lumerians' band members indeed look like cosmic monks during their performances (check first video below) and delivers psychedelic retro-futuristic space-rock full of analog synths, hypnotic guitars, lightly tribal always groovy rhythm patterns and multi-layered vocals. It looks like they have all the time in their live while building up their rather long songs, allowing them to open up, wandering slowly till their conclusions. Even at their most danceable moments, there's something pretty relaxing in Lumerians' music, the groove is souple as some lazy but tight funk, and they sometimes remind me of a couple of bands out of that psyche-rock-meets-dance music madchester era at the end of the eighties, The Charlatans and Stone Roses mostly, but without the rock'n'roll bad boy attitude, Lumerians are more atmospheric, esoteric, if not spiritual, very danceable and mind-bending at the same time, music for the mind and for the belly and feet. Most of the songs begin with bass and drums getting into a groove pattern which will go all through the journey, these instruments pave the road on which the listener is travelling, a rather smooth and straightforward road. Little by little, the band will layer that journey with more and more instruments, colouring the landscapes with stranger and stranger sounds, but even when it gets really weird, these guys remain careful to keep it rather comfy, even if it's going more often than not on some pretty epic rollercoaster ride, they brought the listener to it without him noticing, until it's too late. The terms 'hypnotic' and 'trance-like' have seldom been so accurate to describe a rock album, even so-called psychedelic, than this "Transmalinnia". One does not need drugs while listening to this thing, this thing is the drug. 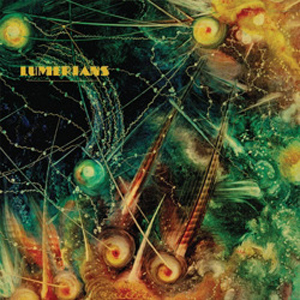 Influences are numerous on Lumerians' debut album, and it seems to me that above mentioned Madchester scene is not part of them, what's surely in their background bag are German krautrockers, Can and Neu! first, but also American electronic pop music pioneer Silver Apples, some bits of The Velvet Underground, some bands on that legendary "Nuggets" compilation, this or that from Hawkwind, then closer to us English Spacemen 3, surely the later for that drones effect all along and softly slightly opiated vocals. They also share some similarities with Wooden Shjips and surely Moon Duo, the last project from Wooden Shjips' frontman, although Lumerians are at the same time lusher and heavier, less noisy and more propulsive. 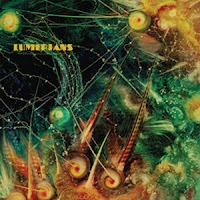 Lumerians' music is far more varied and layered as well, even adding congas and other exotic percussion into the mix which make it sound like some dark 60s exotica, a Gothic Martin Denny. "Transmalinnia" is very well sequenced, each song being a route between two stopping places, the whole album being the entire journey, this means that there are no radical jump from one surrounding to the other, one soundscape to the next one, but changes there are, and plenty enough to sustain interest and even fascination. The album starts at a rather relaxed but high tempo with "Burning Mirrors", layers of analog synths and distorted guitars are added layer upon layer to reach some climax at 3/4 of the song length before calming down before the end. This track almost works as a summary to the album, near everything is there. The following song "Black Tusk" is almost zippy, with syncopated and tight drums, assertive vocals, congas, light synths, the distortions remain in the background. From the third track "Xulux", some unknown menace is showing its ugly head, the song slows down abruptly in the middle, crawling further with ominous but blissful synths lines supported by that prominent repetitive bassline. "Atlanta Brook" follows and takes on slow motion where the previous ended but it gets darker despite the first clear appearance of guitars, melodic and intertwined, which add even more texture to the whole, but something will get nasty indeed : a bacchanal of percussion irrupted, high-pitched synth alarm before psychedelic noise enters the scenery, reverberated and distorted guitars and synths, percussion fireworks, to go further back to the theme of the song. "Calalini Rises" might be the heaviest track, muddy, aggressive, the drummer is hitting his kit like a maniac, tribal and frenzy, the other instruments on the loose and chaotic, a hurricane to the ears. This storm is followed by the shortest and fastest paced song on the album: "Hashshashin", root of the word 'assassin', is like a soundtrack to some grim movie scene. And then comes the monolith of this LP, "Longwave", which goes way over the 9 minutes mark and slows down the tempo as well as lowers down everything else, so much so that it sounds like played at the wrong speed. The drums is completely binary and lead heavy, synths and guitars as thick as that, with the lowest vocals possible, the whole thing wandering somewhere between The Sisters of Mercy and mostly Iggy Pop's "Mass Production" on his seminal album "The Idiot" in 1977. The last song "Gaussian Castles" is the trippiest and the most psychedelic, very unearthly, dreamy, with circular drums and percussion, shimmering guitars, tweeting synths, Lumerians almost sound like some Dumbo Gets Mad's brothers, a colder and more Gothic one. "Gaussian Castles" could be Lumerians' own The Cure's "The Hanging Garden", those circular drums even end up the song in a very similar way. This album sounds like a journey through live, death, travelling through the after-life ("Longwave") and being ascended on a higher plane of existence ("Gaussian Castles"). Well, I'm ready to make that journey over and over when it sounds like Lumerians' debut album "Transmalinnia". I know I'm a sucker for this type of music, I mean Dumbo Gets Mad's earlier album "Elephants at The Door" got me off guard and now I'm even keener on stumbling upon other such psychedelic luminaries, although few gave me such a bliss than these two are giving me the last months. But if I totally enjoy "Transmallinia" from start to finish, there's still that feeling that I've already heard this sound, that groove, this bassline, that drums pattern, this vocals, that gimmick, etc. Actually this album is full of gimmick, a bit like LCD Soundsystem's albums, in a very different style, are full of gimmicks. Concerning LCD Soundsystem, it worked with their two studio albums, it wasn't happening anymore with "This Is Happening" (sic); well it is happening with Lumerians' "Transmalinnia".